You may have heard that much is changing in the recycling world these days. For the last couple decades, China has accepted the majority of the world’s recycled materials– whether that’s plastic, paper, cardboard, or metal. Our recycling programs evolved over that time to encourage more and more recycling of more and more items, with not so much attention focused on “contamination.” Contamination means that there are items in the recycling load that shouldn’t be there (like garbage or leaves or shoes or hoses . . . you get the picture). It can also mean that otherwise recyclable items are dirty and therefore unusable (oily pizza boxes for example). Meanwhile, our society has continued to progress towards more packaging, more disposables, and more single-use items. There’s a lot of recycled material being processed every day in Salt Lake City! Help us minimize contamination by only putting accepted items into your blue container. Globally, we produce upward of 448 million tons of plastic each year, 40% of which is destined only to be used one time. What?!?! But if we threw those plastic plates or cups in the recycling, that was okay, right? Throwing something in the recycling bin became the equivalent of not even using it in the first place! But now China has effectively stopped accepting the world’s recycling and the U.S. is left with a lot of material and a system that isn’t designed to deal with newer, stricter materials standards. In Salt Lake City, disruption of our recycling program has so far been minimal. As we announced in January, please do not put plastic bags, films, or wraps of any kind in the blue container. Do not enclose recyclables in plastic bags or kitchen bin liners (i.e. do not “bag your recyclables.”) This will prevent your items from being recycled. 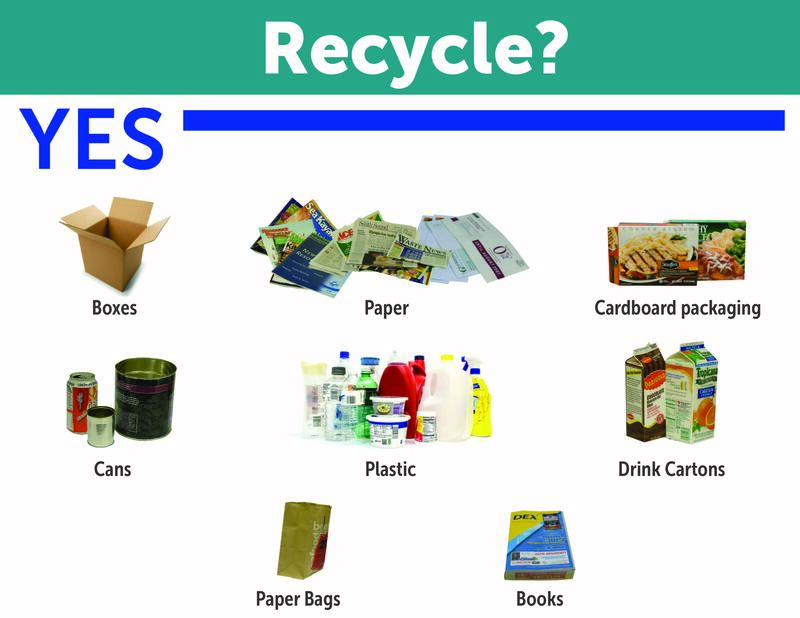 The recycling changes notice that is being placed on Salt Lake City curbside recycling containers this summer. It advises residents to keep plastic bags, plastic film, Styrofoam, and shredded paper out of the blue can. Eliminating these items from our recycling stream is now required in order to meet stricter standards and to ensure the health of Salt Lake City’s overall recycling program. Please know that, while we have had to implement these new restrictions, we continue to work very hard with our processors to secure vendors to accept as much other material as possible. We hope to minimize further changes to Salt Lake City’s recycling program. However, please stay connected with us in case additional modifications of the accepted items list need to be made. So what should you recycle? If it’s not on the list, it should not go in the blue container. (“When in doubt, throw it out.”) However, we do encourage you to utilize specialized collection opportunities, like the CHaRMs hosted by the Utah Recycling Alliance or other organizations for hard-to-recycle materials that cannot go in the blue bin. And that brings us to an important last point. Recycling is still the cornerstone of a successful waste management program and is essential to a sustainable community. It conserves water, reduces greenhouse gas emissions, and saves raw material among other benefits. Salt Lake City collects recyclables from an estimated 45,000 residential homes, and 1,100 small businesses and multi-family complexes every day, five days per week. An average of 750 tons of material are recycled each month. 4,011,430 gallons of water (enough to meet the daily needs of over 50,000 people). The benefits of recycling clearly outweigh the current challenges we’re facing. However, recycling has always been the last of the “Three R’s” (Reduce, Reuse, Recycle), but that order has become ever-more important in the wake of the global crisis in recycling markets. You can also help by exercising your power as a consumer to choose less waste. Thank you for helping SLCgreen provide the most efficient and effective recycling program possible for our community. What NOT to put in your blue recycling can. Yes! What to put in your blue curbside recycling can. I’m skeptical about drink cartons. Does that include a Trader Joe soy milk carton, which shows a mix of foil seal and a plastic screw top? At this time, Salt Lake City is able to take wax-coated drink cartons, such as the ones orange juice comes in. Please do remove any foil. If you can’t, it should not be put in the recycling container. The plastic screw top is fine. Thanks for the question! What?????? I just finished the “master recycler” program and we were told that we could NOT recycle tetrapaks. Please clarify! We double-checked and you are correct. Tetra Paks are still not allowed, so we’ll correct this comment to clarify that. Thank you for the question! Thank you for helping us recycle right! Re: f it’s not on the list, throw it in the garbage. OR, recycle the item in alternate ways. For example, batteries can be recycled at X; textiles including apparel and shoes can be recycled at thrift stores; wine corks can be recycled at Whole Foods, etc. Correct– we meant that if it’s not on the acceptable list it should not go in the blue curbside container. If you find alternative options for specialized recycling, that’s great! Do these same rules apply to my parents in Los Angeles? Can I share your guidelines with them? Please feel free to share our post, but they will need to check their municipality’s recycling guidelines for information that is accurate to where they live. While recycling is a global commodities market, it is also highly local because of the vendors and contracts particular to that location. Thanks for your help! With paper like junk mail and magazines, is it okay to put those in paper bags? Or is it better than it is loose in the bin? Yes you can put them in paper bags, or put them directly in the recycling container. Whatever you prefer! Sorry, why no shredded paper? It looks like you can recycle the packaging that is on the bottom when I purchase meat. They have the recycling symbol on them and I think that they are plastic not styrofoam. Is this correct? Hi Christi, this type of meat packaging is usually Styrofoam (Expanded Polystyrene – #6 – which is a type of plastic) and we cannot accept it for recycling any more. It is considered a “hard to recycle” material. Thanks for the question! I try my best to to recycle everything I can. I know I can recycle paper and aluminum cans, but I’m not sure what else is okay to put in my recycling bin. I appreciate this article telling me to refrain from putting plastic bags and Styrofoam in the recycling bin. The illustration shows books are recyclable in the blue container. The book illustrated is a phone book. I assume then that paperbacks can be placed there. What about hard cover books? Do please clarify if paperback books in general can be recycled in the blue bins, not just phone books. I try to donate most unwanted books to the local libraries for their sales, but some old trade paperbacks aren’t worth donating. They are piling up and I want to be sure they can be put in the bins. Shirl, for hardcovers, do consider donating them. Both paperbacks and hardcovers are recyclable! We should also say that the only limitation is volume– please do not fill up your can with books because it gets too heavy for our trucks and can also damage the container. I have also been confused about what to put in the blue bin.Thank you for this information and especially for the information about China and our connection to global recycling. I had not idea. I will be super careful of what we put in our bin and spread the word to neighbors and Family.Thank you. I really like your tip that if you aren’t sure if something should be recycled, then you should throw it out. It makes sense that you wouldn’t want to risk recycling something that can’t be recycled. My wife is very environmentally conscious, so I will be sure to ask my wife if I should recycle something. I liked how you explained that we should be recycling aerosol cans, plastic containers, magazines, and aluminum cans. My husband and I want to reduce our carbon footprint and improve how we handle our recycling. Thank you for the information about how properly disposing of these items by recycling them will conserve water, reduce greenhouse gases, and save raw materials. Can I recycle the plastic lids from plastic water/soda bottles? If so, do I leave the lids on or off the empty bottle? Hi Kathy, the best thing to do is to leave them on the bottles. Thanks for the question! I see aluminum cans are recyclable. Is tin foil? Many plastic plates have a recycle imprint. Can they be recycled? Hello Vivian. Tin foil can be recycled if it is clean and dry. It’s also most effective if, once dry, it’s compressed into a large ball over 4 inches in diameter. This will help ensure it doesn’t fall through the screens at the recycling facility. If plastic plates have a recycling imprint and they are clean, they are recyclable in Salt Lake City. I will note that some municipalities and haulers are no longer taking #5 containers since these are a harder-to-recycle hard plastic. We still are. Hope that helps. Feel free to reach out to us at slcgreen@slcgov.com or at 801-535-6999 with other questions. What resin ID codes on plastics are acceptable? What about the plastic that, say, ground beef comes in at the supermarket? Hello Patrick, thanks for the question. Resin codes are unfortunately not always a reliable guide for recycling, which is why we don’t specify them. “Plastic containers” of any number are acceptable. Soft plastics, including expanded polystyrene (“Styrofoam”), plastic bags and film, and other wrappers are not recyclable in our curbside containers. Ground beef usually comes in foam packaging, so that would not be recyclable. Hope that helps! We can all step up and be better at recycling. It may seem tedious, but it will make a huge difference. I had no idea how bad the garbage issue was. Now, I pledge to do everything in my power to ensure I am recycling the most I can. I’ve read a lot about recycling from some cities being dumped or being burned (precisely from the end of the Chinese recyclables market). Can you assure me that appropriately recyclable items in Salt Lake blue trash cans don’t end up in the landfill or the incinerator? Thanks for writing. The short answer is Yes: what we list as “accepted” on our recycled list is recycled– not including contaminated material. It is true that over the past year, some municipalities have struggled to find buyers for their recycled materials due to changes from China, the world’s largest recycled materials buyer. Salt Lake City remains ever-vigilant to these changing conditions and has adapted our program accordingly. Our recycling contract specifies that recyclable items that are collected for recycling must be recycled. Beyond our legal agreement with our processor, these are high-commodity materials so it is in everyone’s best interest to ensure they are recycled rather than landfilled. In the event our processor can no longer find a viable market for a recyclable item, we will amend our “accepted items” list appropriately. To our benefit, due to the volume of recycled materials SLC generates as a community—and the relative high quality of those materials – we have been able to secure buyers for recyclable items. Contamination is a separate matter. All recycling programs experience some amount of “contamination” when dirty or unaccepted items are mixed with recyclable items. Food, liquids, animal waste, dirt, glass, messy garbage— these materials can contaminate otherwise recyclable items in the cart or in a truck, meaning some recyclables have to be landfilled. This is why we are so focused on reducing contamination by educating residents on how to recycle. We engage in online and in-person outreach to support this goal. It has resulted in a below-average contamination rate for Salt Lake City. Plastic bags and film are also considered a contaminant because they disrupt the operation of a recycling facility. Finally, harder to recycle plastics (numbers 3-7) are a lower-value commodity. At this time, because they do not have a recycling outlet in a mixed recycling facility, we are diverting those items from the landfill to be used as fuel for cement production. Similarly, most municipal programs have stopped accepting plastics 3-7 entirely or are diverting them to waste to energy uses. Please reach out to us at slcgreen@slcgov.com if you have any further questions or we can chat in more detail. Thanks for your support of recycling!